I was sixteen years old when the events involving President Nixon and his Vice President Spiro Agnew took place. I was aware of Watergate and the resignation of Nixon. I can’t say that I had any recollection of Spiro Agnew. I wish I had paid more attention. A word you hear a lot today about our current administration is unprecedented. Well, it turns out we’ve seen this all before, and it didn’t end well for Nixon and Agnew. Tell me if any of this sounds familiar: witch hunt, demonizing the media, claiming that investigators have a political bias? The crimes of Nixon are well known. The sins of Agnew are equally egregious. The guy took in hundreds of thousands of dollars in kickbacks and bribes. He started his criminal enterprise as Governor. He didn’t stop when he became Vice President. 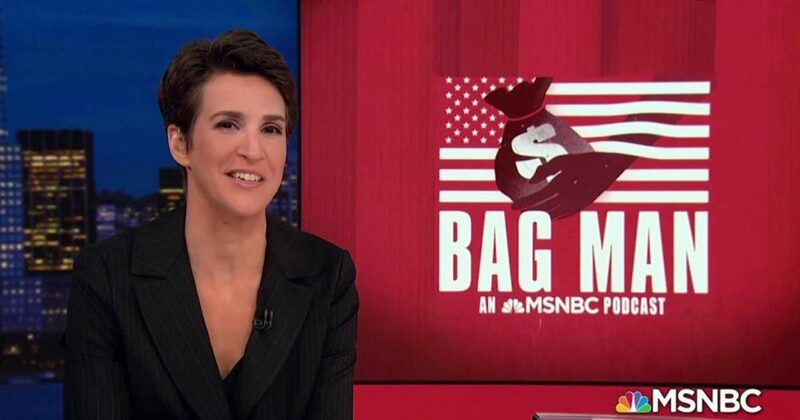 The seven episodes in this Podcast are expertly crafted, using sound clips from contemporary interviews, sound bites from original news sources and interviews, and Rachel Maddow’s narration that ties everything together. It’s an immersive experience. Agnew denied everything. He claimed that he was the victim of a partisan attack. A large percentage of the population believed him. They voted for Nixon and Agnew. They fell for the lies; they turned their anger against the media; they were blind to anything that showed that they cast their votes for the wrong guys. If you want to see where we are headed in the next two years, listen to this podcast. Just finished Bag Man. History does indeed help. Keep digging and keep reporting please.